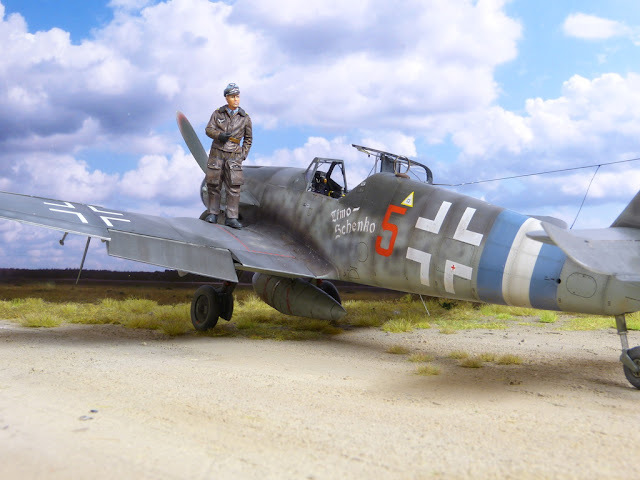 amazing build and finish of a couple of Revell 1/32 Bf 109s, the G-6 by Mike "Spikelhund" and the G-10 in the markings of 'Timo' Schenk by Andy Dyck posted on britmodeller.com and reproduced here with permission, probably two of the best I've seen. Exquisite detail, paint and finish! 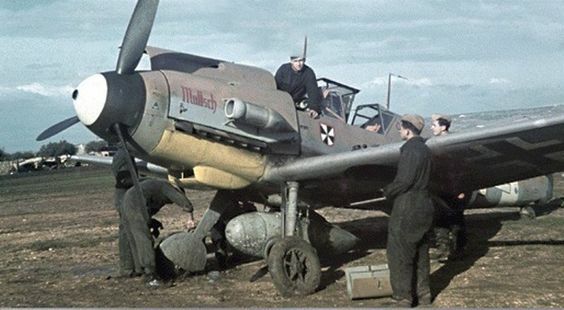 The Bf 109 G-6 W.Nr. 412 369 "Gelbe 6" in the markings of 6./JG 53 as seen in January 1944 was completed with Eagle Cal decals, Barracuda intake, exhausts, cooling scoops and oil cooler housing, AlleyCat cowl bulges, spinner and prop, Maketar masks for national markings, Brassin gun pods and an Eduard fabric harness. Paints are Gunze, Tamiya, Vallejo and Citadel, Mike also used the AMMO PLW for the panel lines and some weathering. Final flat coat with AK ultra matte. Click to view large! 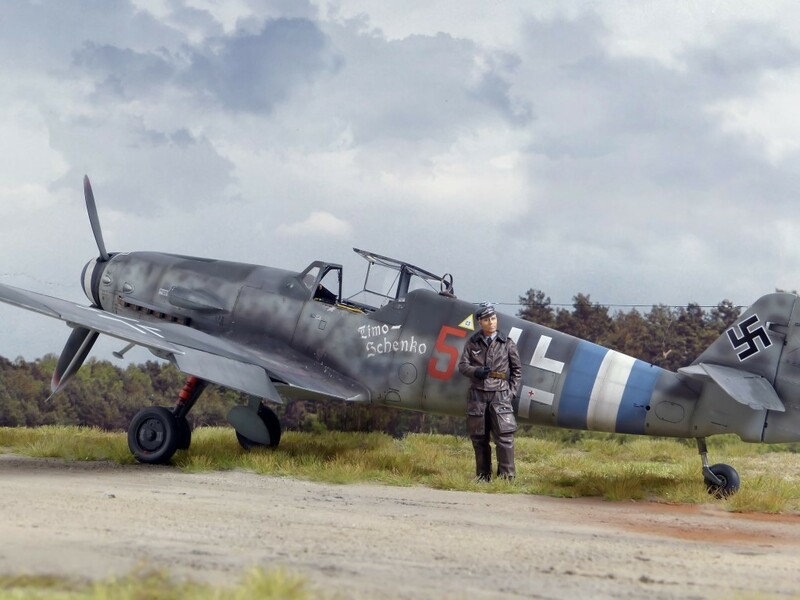 Below; Andy Dyck's build of Revell`s fantastic 109 in 1/32. Andy said " I added some parts, like exhaust pipes from Barracuda studios, decals from Barracuda studios, and seat belts from HGW (Lasercut). The whole model was completly riveted with the HobbyBoss rivet tool. The figure in the leather suit is also from Barracuda..."
"Red 5" was a G-10 flown by Lt. Friedrich-Wilhelm “Timo” Schenk, Staffelführer of 2./JG 300. Rare photos of this machine feature in Jean-Yves Lorant's two volume JG 300 history 'Bataille dans le Ciel d'Allemagne' published by Docavia. 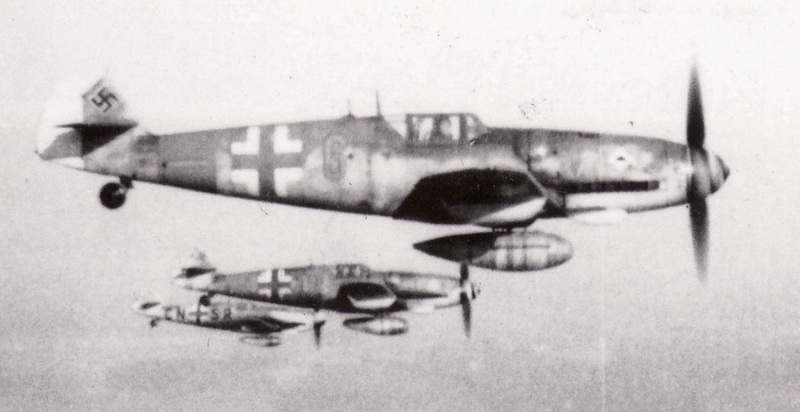 While the inscription on the fuselage 'Timo-Schenko' is a neat piece of word-play, it must have taken a certain amount of courage for Schenk to fly strafing sorties on the Oder front over Russian spearheads with his machine displaying the name of the Russian military commander leading the assault on Berlin during the Endkampf. And while no pictures show the blue-white-blue fuselage bands, 'Red 5' almost certainly displayed them. I was fortunate enough to correspond with 'Timo' a few years ago via Jean-Yves Lorant.
" Liegnitz - February 1945. The Russians had crossed the Oder near Steinau. Our exhausted and over-extended ground troops were in desperate need of close air support.. When the weather allowed, we flew uninterrupted sorties, up to eight a day for some of us. The fields and roads between the villages were teeming with thousands of people, women, children, the elderly, all attempting to flee the Soviet invasion in the bitter cold. Most of the columns of refugees were heading for Dresden. Viewed from the sky these caravans of civilians clogging the roads painted a picture of unspeakable suffering. The Russians were everywhere. We flew strafing attacks with variable results. Going into action at low level against ground targets, tanks, vehicles and infantrymen, was far from easy..".